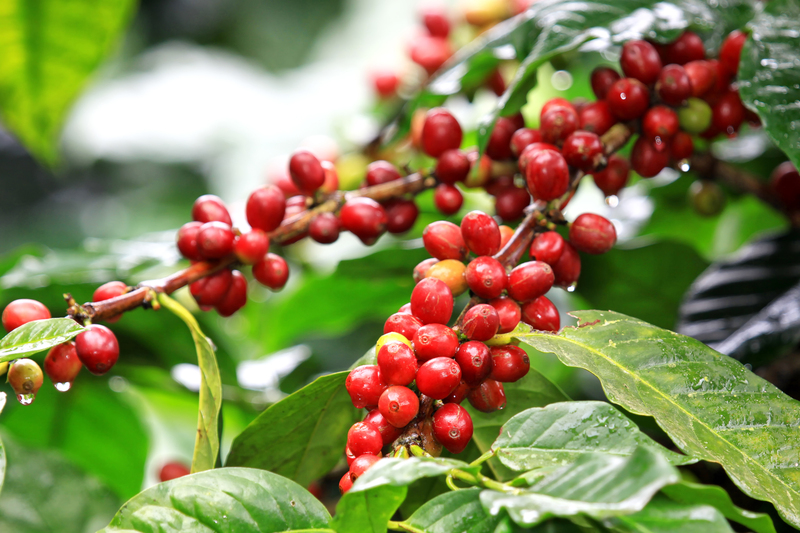 The seeds, coffee tree and cherries/ beans are all interconnected. The people connect the plant materials and the factory materials together. The cherries/ beans are then interconnected with the water mill, pulping machine, rotating drum and roasting machine, which are all interconnected as well. The seeds are planted in a container for a year. They are then planted in a field where they grow to maturity. Once they age properly they grow flowers which then turn into the cherries which contain the coffee bean. The cherries start out green then turn red. When they are red they are ready to be picked by the farmers. The farmers bring them to the factory to be processed. The cherries are placed in a water mill that cleans the surface of the cherries. They are then dropped onto a water screw that takes them to a pulping machine. The pulping machine removes the skin of the cherry. Next they get sent to a rotating drum that squeezes the bean out of the cherry. The beans get sent to another water mill that removes any leftover cherries and cleans off the beans. The beans then get sent to a bin and are taken from the bin by people and taken outside to dry in the sun. Once dry the beans are put in a rotating drum that removes the shell of the bean. Then they are sent to an oscillating table that separates the beans by weight. The beans are bagged up and sent to a roasting machine that cooks them to perfection. Coffee is the second most traded commodity after oil. It is an incredibly popular drink that people all over the world enjoy. People drink it for leisure, taste or caffeine. This assignment was made with the help of caffeine from coffee 😉.